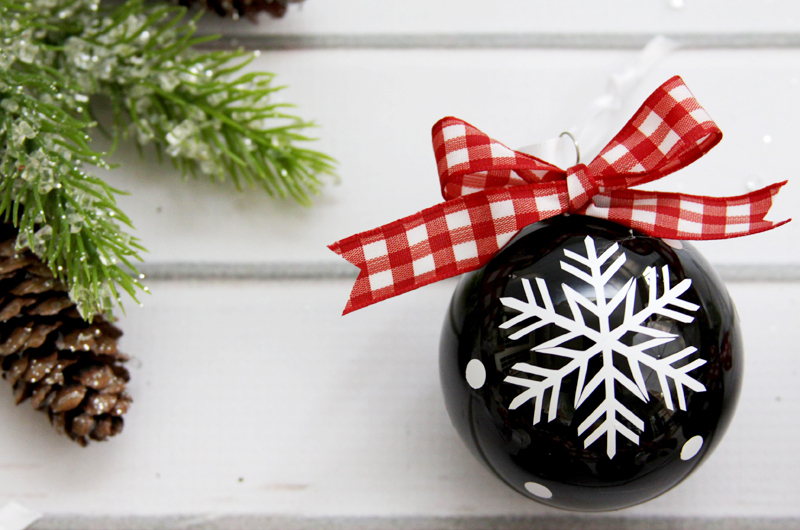 I have an quick and easy Ornament DIY for you today! 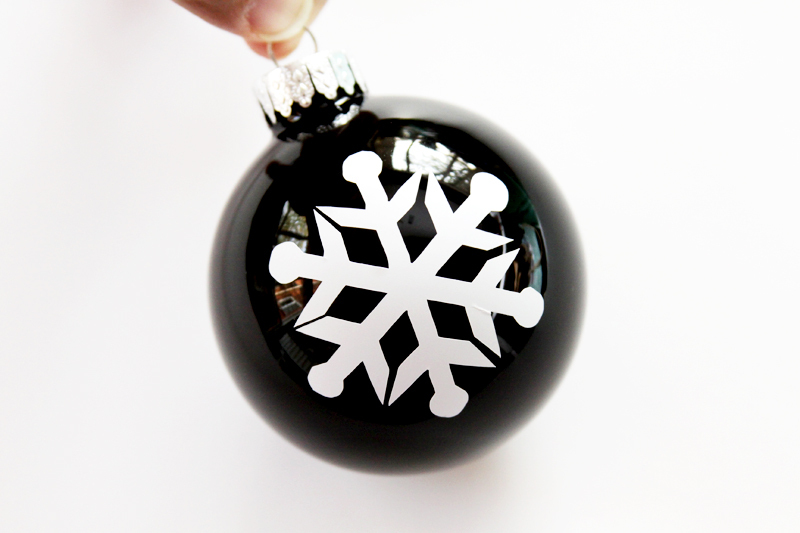 These Chalk Style Snowflake Ornaments really turned out fun! 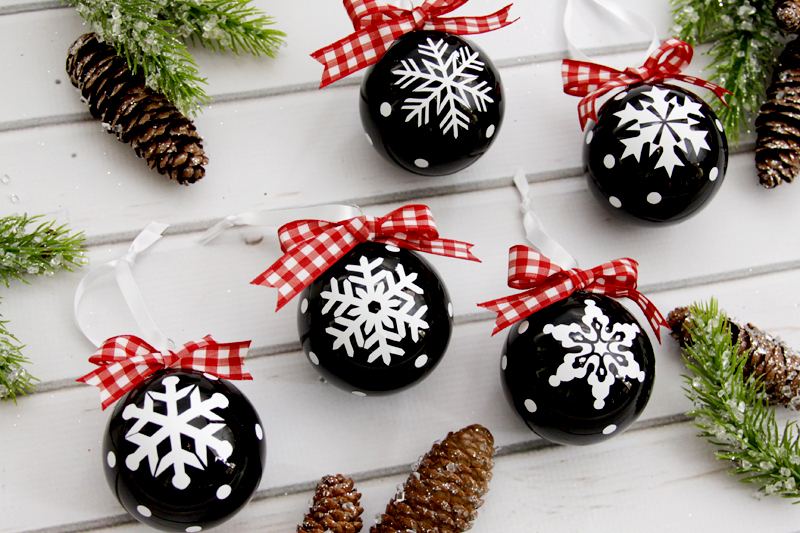 I love how simple they were to make and you can really change them up for your decor and tree style. I am working on putting together a chalk and plaid inspired tree so I thought these would work out great! 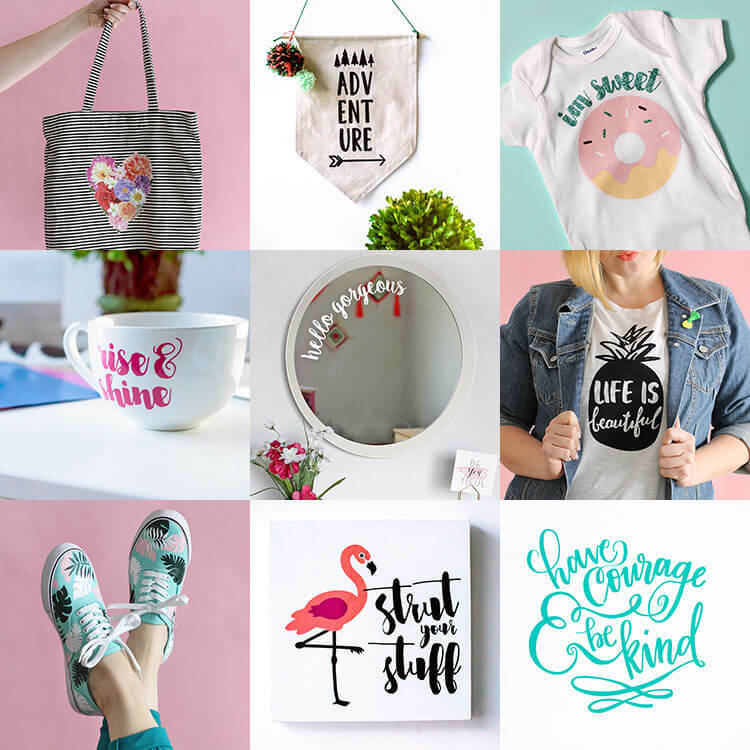 I am also joining in with other talented bloggers to share over 20 amazing vinyl projects and a fabulous giveaway with you all to celebrate the launch of Alexis of Persia Lou‘s new Craftsy Class – Silhouette Saavy: Venture into Vinyl, a brand new online video class that will teach you everything you need to get started cutting vinyl with your Silhouette. In the course, Alexis will walk you through creating eleven different vinyl projects. You will get all the cut files you need as well as video guidance for each step, and you will learn techniques such as layering adhesive vinyl, cutting large-scale decals, using the print and cut feature with printable heat transfer material, creating vinyl stencils for screen printing, and more. Aren’t they all so cute?? 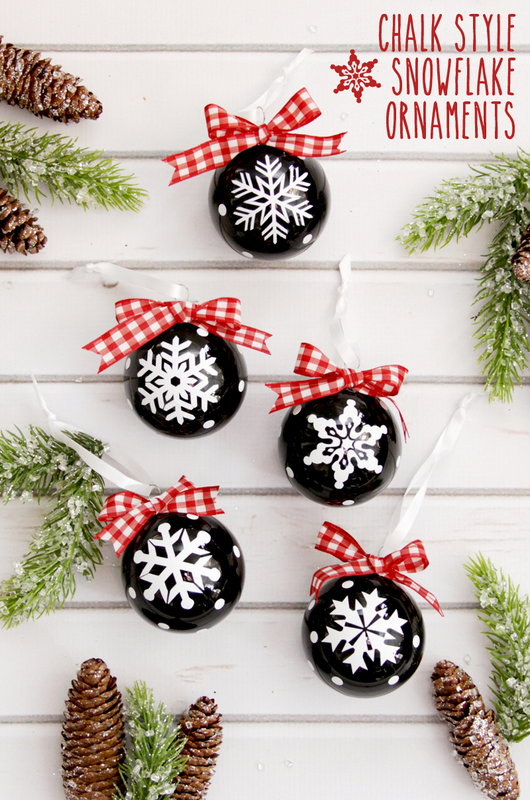 But first, let’s make up some simple chalk ornaments using vinyl! These are so simple to make. 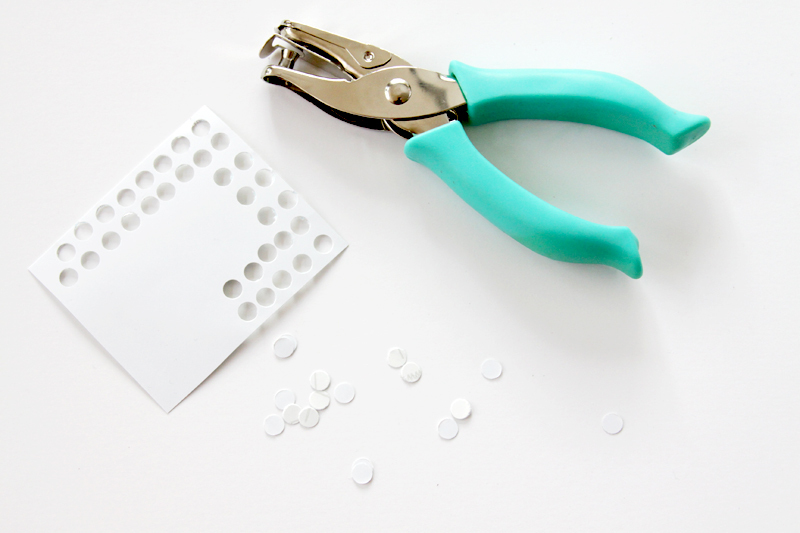 They’d be great for a craft night project too! The snowflakes are super easy to make. I used the font lp snowflake. All you have to do is download the font, then when you type letters, snowflakes show up instead! 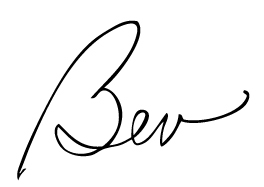 The font is free from the website DaFont, I have used them for years and it’s safe to download from them. 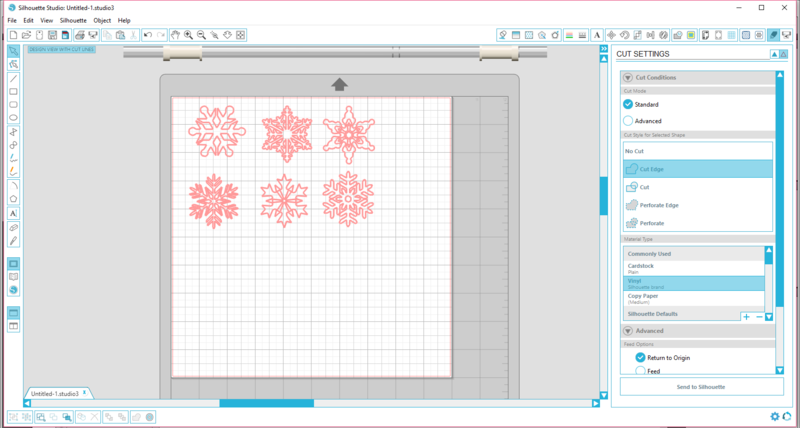 Use your favorite cutting machine software and choose the snowflakes you’d like for your ornaments. 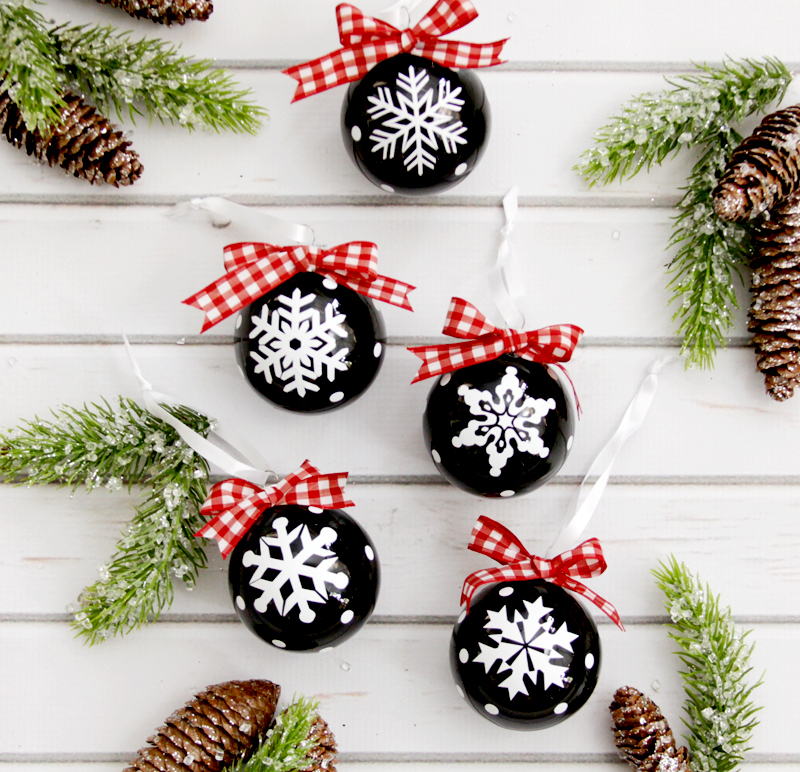 Size them to about 2″ tall for your ornaments. Cut your snowflakes out. Once you cut out the snowflakes, cut apart each snowflake so you can work with them individually. Remove the vinyl around each snowflake. 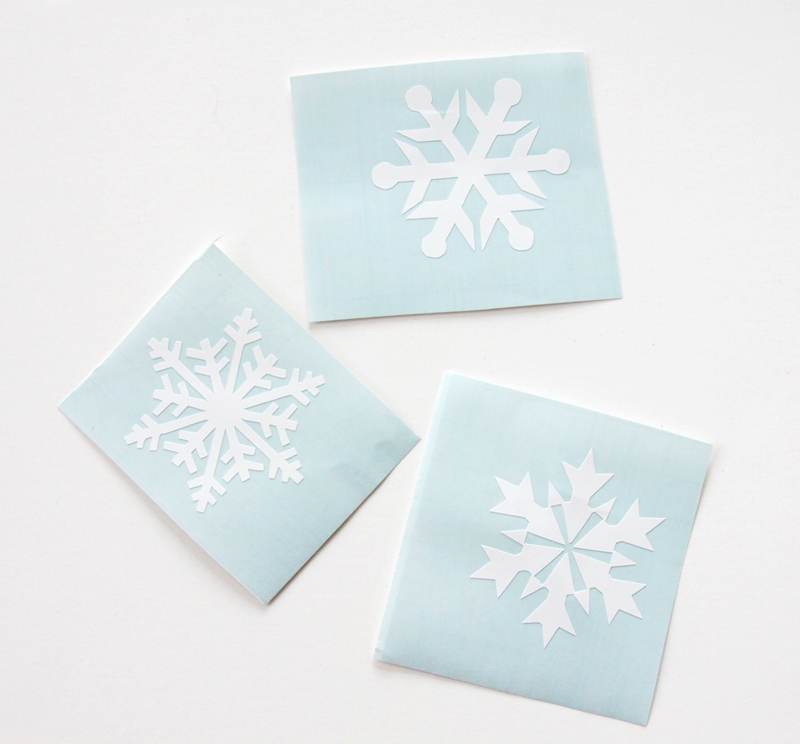 Apply a small piece of vinyl transfer paper on top of the snowflake. 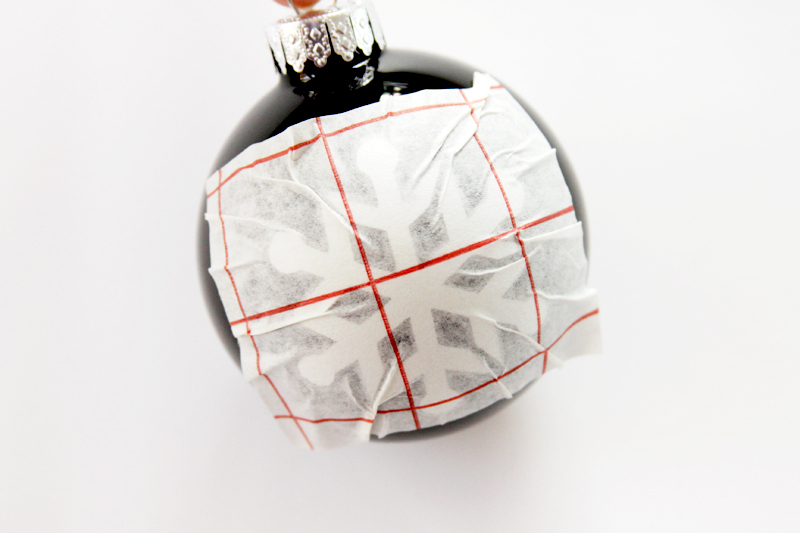 Peel up the transfer paper and vinyl and center the snowflake on the ornament. Press down the center section first, then work to the diagonal spokes, making sure the vinyl is pressed completely down to the ornament. 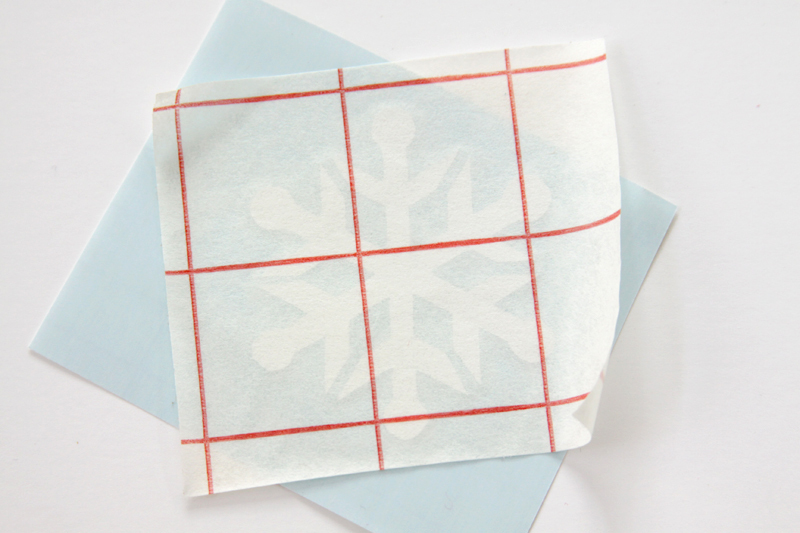 You’ll have some wrinkles in the transfer paper but try and keep them out of the vinyl. 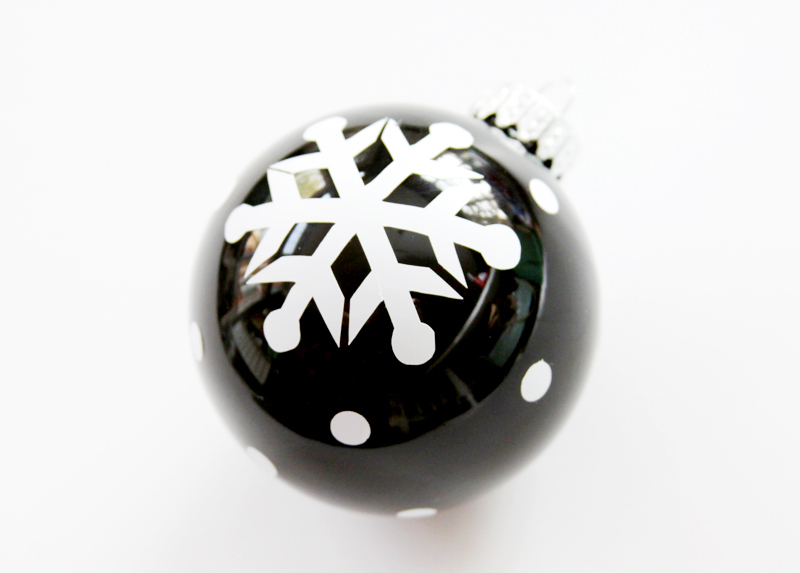 Remove the transfer paper and make sure the vinyl is completely attached to the ornament. 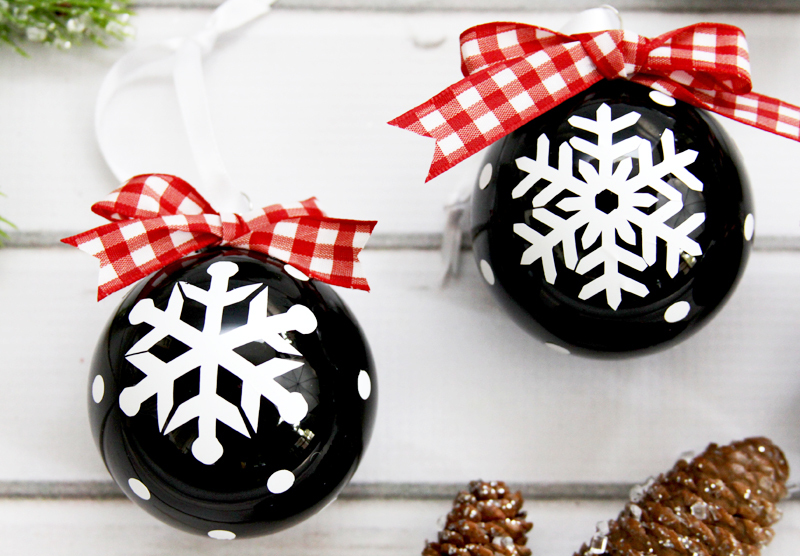 To make the little dots on the ornaments, cut out a square of your vinyl and use a hole punch to create a bunch of little circles. 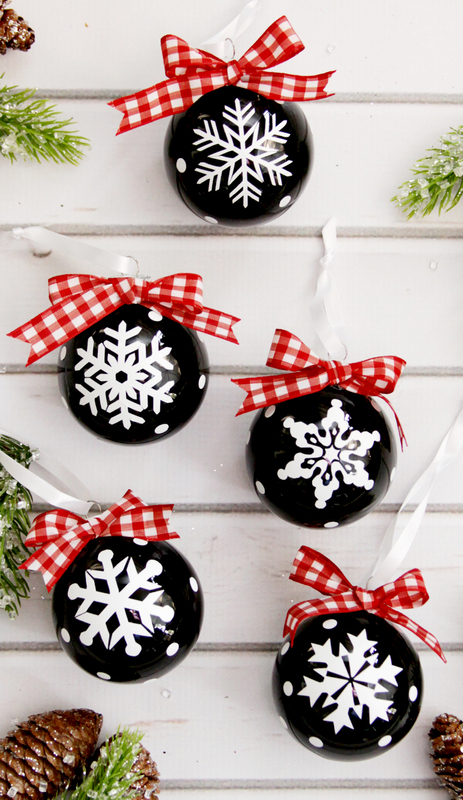 Remove the backing and stick them to the ornaments. 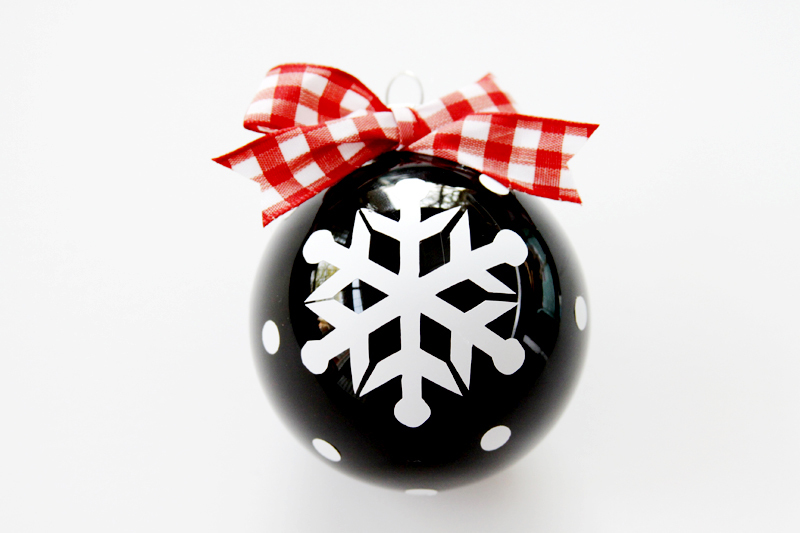 To finish off the ornaments, create a little ribbon bow and glue in place on the front. Cut a length of small ribbon and thread through the top of the ornament and knot at the top for a hanging ribbon. 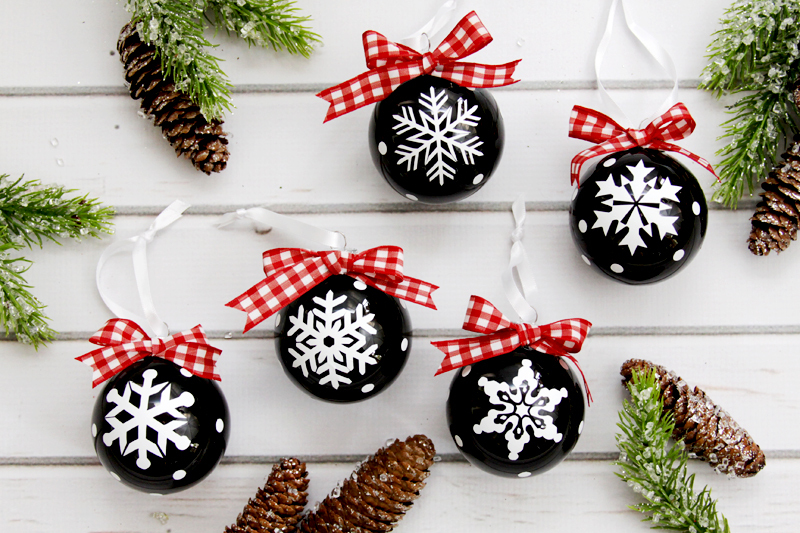 Finish up your other ornaments for a pretty variety of snowflakes! I love these! They are so pretty!